Put A Little Umbrella In Your Drink: FREE Shipping Friday at Over 200 Stores! It might be the perfect day to finish your Holiday Shopping! 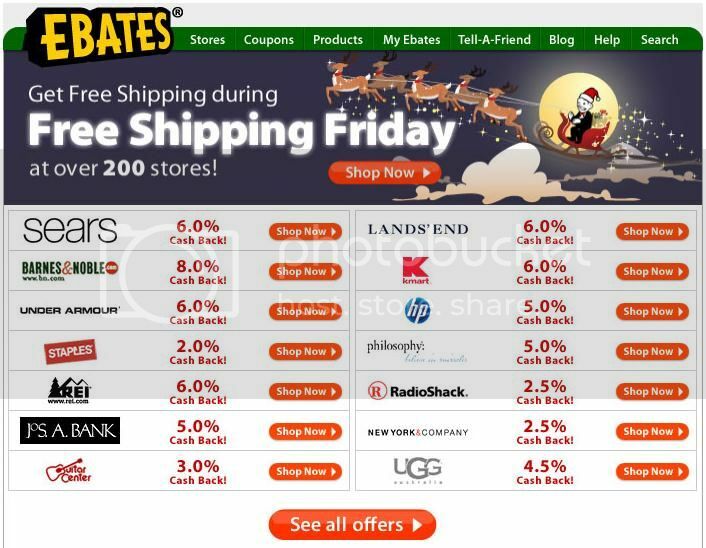 Ebates has FREE SHIPPING today at over 200 stores! PLUS you will be getting CASH BACK! Step 1 :: Go to Ebates to find the Cash Back deal for your favorite store! Some of the store that are included are offering up to 17% Cash Back! Step 2 :: The stores featured in this promotion are offering Free Shipping + Cash Back offers. Find your favorite store and click on the link through Ebates! If you find your favorite store is not on the list, try Retail Me Not. You might still be able to find a Free Shipping Code that you can use there. Cash Back Offers change often so be sure to check Ebates for the current cash back offer for your favorite store.